Few days back while going through the press release of Lakme Absolute Monochrome collection i saw Kareena's pictures sporting a night look using the same collection. The first thing that came to my mind was... Katy Perry .... ??? 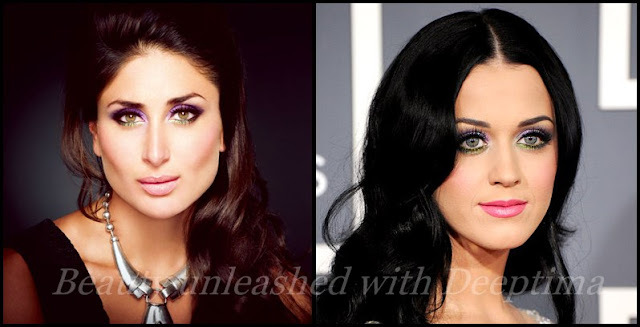 i had this picture of Katy Perry on my desktop with purple and green eyeshadow and its soo 'similar' to the look that Kareena had on.. The shade of purple in both the looks is different, but the idea is pretty much the same, Katy being lighter to Kareena has a lighter shade of purple. I liked both the looks, perfectly done to compliment their complexion and style. Which variant you liked more ? ?